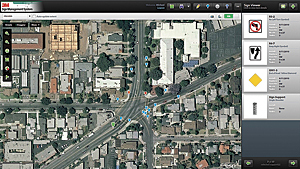 Glendale's 3M sign management system uses ArcGIS to help organize and display sign information easily. 3M staff determined that ArcGIS was better suited to the job than open source products. The interface is very graphic in nature, since it uses ArcGIS web map services. Got signs? The City of Glendale, in Los Angeles County, California, does. In fact, it had 2,000 more street signs than it thought it did. While this surprise may not seem to be a big deal to some, for Glendale City staff, not having an accurate count of their street signs could mean the difference between staying in budget and exceeding it by thousands of dollars. "Each street sign costs at least $200," says David Lew, parking and traffic supervisor, City of Glendale. "If we need to replace them and end up miscounting by a couple thousand signs, we could be in a pretty big financial hole." 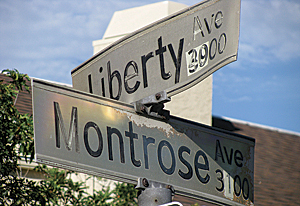 Glendale city staff manually inventoried their street signs for decades by driving the city streets and recording where signs—including street name and road safety signs—were located. While this system seemed to work well, the introduction of new minimum reflectivity standards, as well as a timetable for city agencies to comply with these new regulations by the Federal Department of Transportation, pushed the city to adopt a more comprehensive solution for road sign management. Glendale staff needed to get a better handle on what their street sign inventory was for replacement and maintenance purposes. The city found itself helping beta test and implement a 3M sign management system that uses ArcGIS to help organize and display sign information more easily for office and field-workers. Headquartered in St. Paul, Minnesota, 3M is a $30 billion company creating unique products that make people's lives easier. The company prides itself on its innovation and takes the business of inventing seriously. Finding a solution for inventorying street signs was tackled with the same visionary thinking that has made the company so successful. The 3M sign management system is used by the sign and traffic department at the City of Glendale, where a staff of nine uses the system for maintenance to accurately budget for and plan sign replacement in the city. 3M coordinated inventory of all the street signs for Glendale, including data capture and asset assessment, and put it into the software solution. City staff were then trained on the management tools they would be using to update and keep the inventory current. 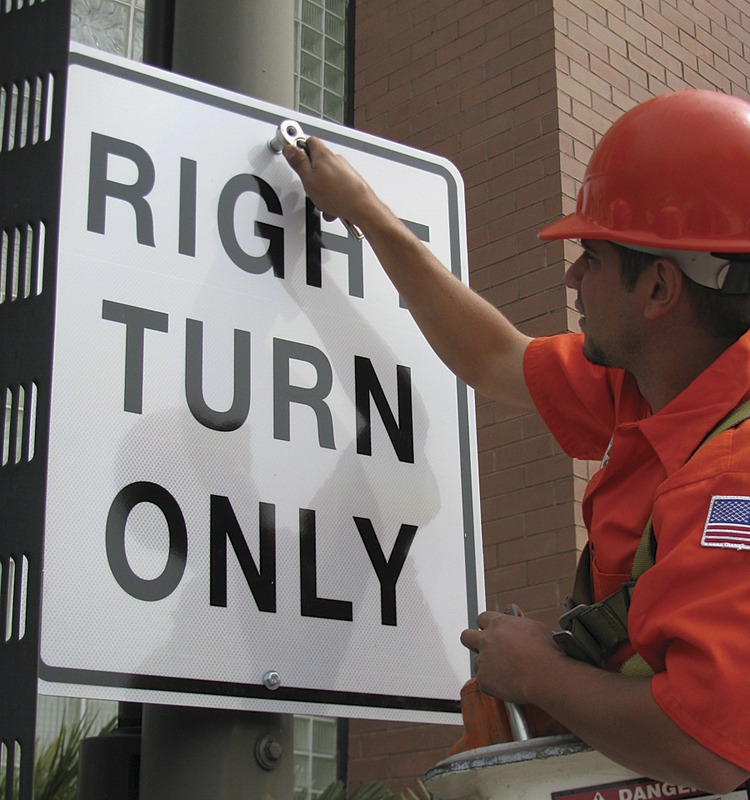 Having a system that manages street signs is helping Glendale maintain assets more efficiently, keep constituents safe, and protect the city against lawsuits and noncompliance. "We really had no idea how many signs we had," says Lew. "We found out that our estimating was only off by 2,000 signs, out of 28,000 that the city maintains, which is pretty good. But when you are talking about being required to replace signs every 5 to 10 years and having accurate data in case of accidents or lawsuits related to signage, every sign is important." 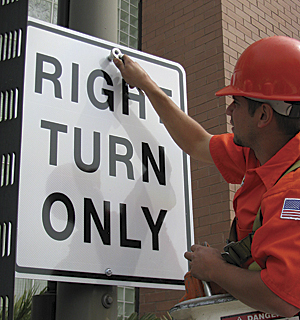 3M has performed hundreds of traffic engineering studies and uses this knowledge to build in predictive modeling for sign management that assesses the sign type, installation data, and other attributes to estimate when the next replacement date for each sign may be. This intelligence makes it easier for Lew's staff to manage the sign inventory. They can query the signs to find those that are deemed critical for maintenance or signs that possibly fall below the federal minimum requirements. After the signs are found, a work order can be placed in the system and downloaded on a mobile device by a crew member out in the field. The mobile devices used contain GPS receivers, so as a field-worker approaches the sign, he or she can select the sign that appears on the screen, ensure that it is the correct sign that needs to be replaced, pull up and fill out the work order, and then sync the work order back up into the system. "This system works especially well in an emergency situation, such as replacing a sign that has been knocked down," says Lew. "Within a couple of hours, the sign can be fixed and the work order processed." One of the nice aspects of the system is the fact that the web interface that is used back in the office is the same interface that is seen on the mobile devices. 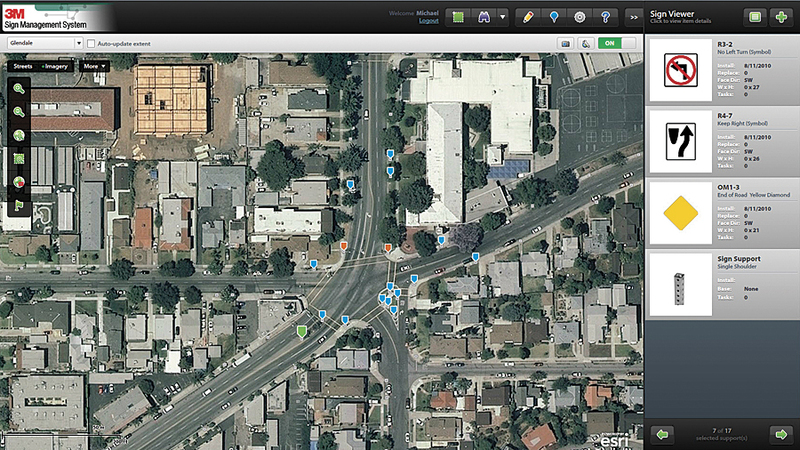 The interface is very graphic in nature, since it uses ArcGIS web map services. These services provide an interactive map for workers to pan and zoom so they understand exactly where the signs are located in the city. This has made training the staff very easy, especially important in California city agencies, where fiscal troubles have meant moving staff to different departments or reducing the work force. "Once the staff is trained on one system or the other, it's a done deal—we don't have to retrain them," says Lew. "This is a huge time- and money saver for the city." 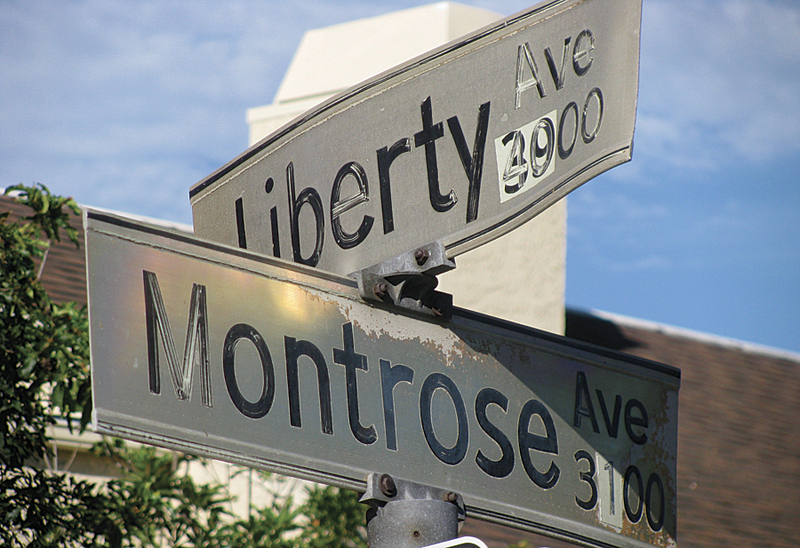 Having a system that manages street signs is helping Glendale more efficiently manage assets, keep constituents safe, and protect the city against lawsuits and noncompliance. As the city continues to grow and more streets are added to accommodate this growth, there is a system in place to maintain those new signs. And no longer will agency workers put up a new sign at an intersection and forget about it. All these signs will be appropriately tracked in a manageable way. "Signs have a definite life to them," says Lew. "After a few years, they lose their reflectivity. We as a city have to take care of this problem so motorists can see the signs, especially at night." Glendale is maintaining its system at the city, but other cities have the option of a cloud-based system where 3M can host it on its own servers. "This is a nice option for smaller municipalities that may not have the budget of larger cities but still have the responsibility to maintain their street and road safety signs," says Debra Gaborik-Snyder, business development and project manager for 3M's traffic safety systems division. A cloud solution meant that 3M needed to find a level of service that had little or no interruption and systems that could all talk to each other in a common language. At first, 3M staff looked at open source GIS technology but, working with Esri Partner GIS, Inc., based in Birmingham, Alabama, chose ArcGIS instead. Says Gaborik-Snyder, "Choosing one platform that is proven and has the kinks worked out will save us and our clients time and money in the end." For more information, contact David Lew, parking and traffic supervisor, City of Glendale.